Through a program initiated in 1989, these cuddly bears are given to children experiencing traumatic events to offer them comfort and reassurance in a time of crisis. 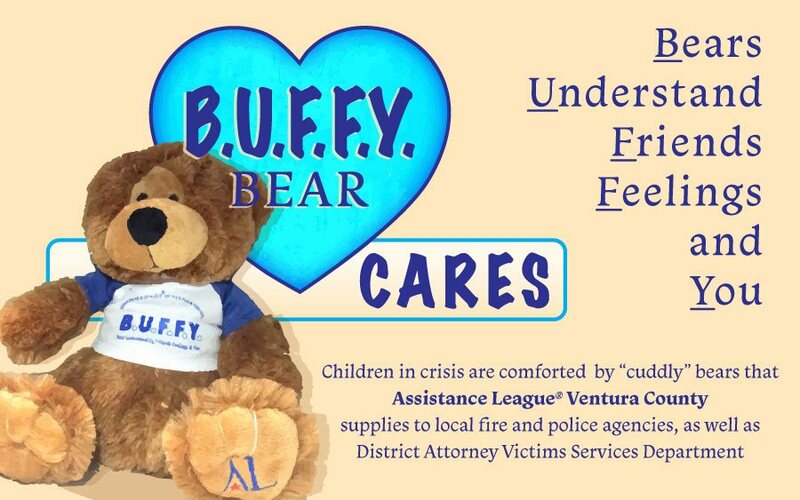 The bears are distributed by Assistance League members to the Ventura County District Attorney’s Office for their Crime Victims Assistance Program and Child Abduction and Recovery Unit as well as to local hospitals, police and fire departments. A story was told by a woman whose son received a B.U.F.F.Y. Bear from firemen who were the first responders when her husband committed suicide. Her son was only five years old. When the firemen arrived, her son was given a B.U.F.F.Y. Bear to wrap his arms around to comfort him. She said, “Do you know that he slept with that bear for years?” Today, this young man has graduated from college, finished his Master’s Degree, and will be a new father next year. Members of Assistance League delivered B.U.F.F.Y. Bears to the Ventura Area Highway Patrol Commander, Captain Terry S. Roberts, and his Public Information Officer, Rolando Tejeda. Captain Roberts had requested two bears for each of his twenty-six patrol vehicles. These cuddly bears will be given to Ventura County children in crisis situations to provide comfort and help them feel better. Pat Zenone, Pat Supko and Barbara Houser participated in the delivery of the B.U.F.F.Y. Bears. In addition to the Highway Patrol and the Ventura County District Attorney’s Office, other agencies receiving bears include the West County Sheriff’s Department, Ventura County Medical Center, Ventura Community Memorial Hospital Palliative Care Unit, Santa Paula Police Department and Hospital, Ventura City Police and Ventura Fire Department, Fillmore Fire Department, Oxnard Fire Department and St. John’s Pleasant Valley Hospital Subacute Care Unit in Camarillo.